The Secretary General of the Council of Europe (French: Secrétaire général du Conseil de l'Europe, German: Generalsekretär des Europarates) is appointed by the Parliamentary Assembly on the recommendation of the Committee of Ministers for a period of five years. He or she is entrusted with the responsibility of meeting the aim for which the Council of Europe was set up in London on 5 May 1949, namely to achieve greater unity between its Member States for the purpose of safeguarding and realising the ideals and principles which are their common heritage and facilitating their economic and social progress. Although the Secretary General's powers are not clearly defined, in practice the holder has overall responsibility for the strategic management of the Council of Europe’s work programme and budget and oversees the day-to-day running of the Organisation and Secretariat. On May 12, 2009 the Committee of Ministers informed the Parliamentary Assembly that there would be only two candidates for the post of Secretary General: Thorbjørn Jagland (former Prime Minister of Norway) and Włodzimierz Cimoszewicz (former Prime Minister of Poland), thus rejecting a Belgian appeal to add two more people to the list of the candidates. Coincidentally, both candidates were Prime Ministers at the same time (1996–1997) and both are social democrats. On June 23, the Council of Europe Parliamentary Assembly decided to postpone the election at least until its September session, thus leaving the chair empty from 1 September 2009. The Parliamentary Assembly was angered by the decision of the Committee of Ministers to remove two of the four candidates from the shortlist: Belgian senator Luc Van den Brande and Hungarian parliamentarian Mátyás Eörsi, who are both members of the Parliamentary Assembly. On 11 September 2009, reporting on the election controversy, Le Monde reported that the future Secretary General would inherit an institution that was in crisis. On September 30, 2009, Thorbjørn Jagland was elected as Secretary-General. On June 24, 2014 he was re-elected to a second, five-year term to start on October 1, 2014. ^ Judith Crosbie (June 23, 2009). "Council of Europe defers secretary-general vote". EuropeanVoice.com. Retrieved 29 August 2009. ^ Smyth, Jamie (2009-05-12). "Council to battle Russia on Protocol 14". Irish Times. Retrieved 2009-09-15. ^ Smolar, Piotr (2009-09-11). "Le futur secrétaire général du Conseil de l'Europe héritera d'une institution en crise". Le Monde. Retrieved 2009-09-15. ^ "THORBJORN JAGLAND ELECTED SECRETARY GENERAL OF COUNCIL OF EUROPE". panorama.am. 2009-09-30. Retrieved 2009-10-02. ^ "Election of the Secretary General of the Council of Europe: Candidatures received". Council of Europe. 11 January 2019. ^ "Didier Reynders stelt zich kandidaat als secretaris-generaal van Raad van Europa". VRTNWS. 7 January 2019. ^ "Lithuanian govt nominates Kubilius for Council of Europe's secgen". Baltic Times. 27 December 2018. Thorbjørn Jagland is a Norwegian politician from the Labour Party, currently serving as the Secretary General of the Council of Europe. He served as Prime Minister of Norway from 1996 to 1997, as Minister of Foreign Affairs from 2000 to 2001 and as President of the Storting from 2005 to 2009. Parliamentary elections were held in Norway on 14 and 15 September 1997. Prior to the election Prime Minister Thorbjørn Jagland of the Labour Party had issued the 36.9 ultimatum declaring that the government would step down unless it gained 36.9% of the vote, the percentage gained by the Labour Party in 1993 under Gro Harlem Brundtland. Whilst Labour won a plurality of seats, they were unable to reach Jagland's 36.9% threshold, gaining 35% of the vote. Włodzimierz Cimoszewicz is a Polish politician. Artis Pabriks is a Latvian politician. Since January 2019 he has been the minister of defence and deputy prime minister of Latvia. From 2014 to 2018, he was a Member of the European Parliament. Andrius Kubilius is a Lithuanian politician who was Prime Minister of Lithuania from 1999 to 2000 and again from 2008 to 2012. He was leader of the conservative political party Homeland Union – Lithuanian Christian Democrats. Didier J.L. Reynders is a Belgian politician and a member of the Mouvement Réformateur (MR). He held various positions in public institutions before becoming a member of the House in 1992. He has been a minister without interruption since 1999: Federal Minister of Finance until December 2011 in six different governments, then Federal Minister for Foreign Affairs, Trade Foreign Affairs and European Affairs in two governments. Following the government crisis of December 2018, he inherited in addition to the post of Minister of Defense. Rita Irene Ottervik is a Norwegian politician for the Labour Party, who has served as the mayor of Trondheim since 2003. Franciscus Cornelis Gerardus Maria Timmermans is a Dutch politician and diplomat serving as First Vice-President of the European Commission and European Commissioner for Better Regulation, Interinstitutional Relations, the Rule of Law and the Charter of Fundamental Rights since 2014. He is the lead candidate of the Party of European Socialists (PES) for President of the European Commission in the 2019 European elections. Charles Yves Jean Ghislaine Michel is a Belgian politician who is the current Prime Minister of Belgium. He is the son of Louis Michel, also a prominent politician. Charles Michel was the leader of the francophone liberal party Mouvement Réformateur (MR) since February 2011 until becoming Prime Minister. Michel is the youngest Belgian Prime Minister since 1845. Martin Kolberg is a Norwegian politician for the Labour Party. He served as the party secretary from 2002 until 2009. He was elected to the Parliament of Norway in 2009 and since 2013 serves as leader of the Standing Committee on Scrutiny and Constitutional Affairs. The five members of the Norwegian Nobel Committee award the Nobel Peace Prize every year. They are appointed by the Parliament of Norway and roughly represent the political makeup of that body. The committee was established in 1897, and has awarded the prize most years since 1901. Fifty-four people have sat on the committee, of which ten have been women. Thirteen have been chair and six deputy chair. Since 2009, the members are former parliamentarians Thorbjørn Jagland, Henrik Syse, Inger-Marie Ytterhorn. 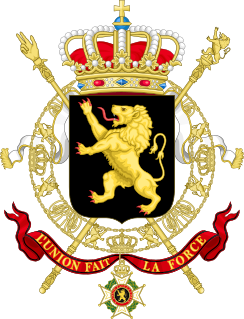 The Verhofstadt II Government was the federal government of Belgium from 12 July 2003 to 21 December 2007.